I started my career in non-profit fundraising because I wanted to help with the advancement of women and girls, but my first job was being a telemarketer. I didn't do it for long, but I learned a lot about rejection. I got used to being told "no" and learned how to separate it from my value as a person. It helped me later when I became a fundraiser. I don't have issues asking people for support. If they turn me down, I don't internalize it or let it determine my self-worth. I got my first fundraising job through my network. I was smart and driven, but lacked experience. I was fortunate to have sponsors who showed me the ropes. I remember when I worked for the Seattle Girls' School, a board member took me under her wing. She pulled me aside one day and asked me if I wanted to learn the secrets to raising money. She told me to wear a suit, show up at a meeting the next day, and watch and learn. She introduced me to a philanthropist who also mentored me. For the next six months, I went to meeting after meeting with her - learning and observing. I learned how to fundraise, ask for support, and expand my network. Virtually every major opportunity has come through my network. When I moved to Boston and New York - people introduced me to others who opened doors. It's how I got to Simmons College, The White House Project, Levo, and being on Sheryl Sandberg's launch team for LeanIn.Org. Today, I see myself as an evangelist with a portfolio career where at the core I'm advancing women and girls through my voice, passion, purpose, and advocacy. The sponsorship and investment other people have made in me. I grew up in a middle-class Seattle home, but I didn't go to Ivy League schools, and my parents didn't have the background where they could introduce me to people. My parents grew up in Watts - with my father being one of 11 kids and my mother having me when she was 19. There were people who were invested in me and helped make introductions to advance my career. Because of this, I've always delivered for them. If someone opened a door for me, I would run through it and worked as hard as I could. The moment that most impacted me was when I was working at The White House Project and, as its new president, I had to give the opening remarks at our annual Epic Awards. I tried to memorize my speech, but had a printed copy just in case. When I was walking up to the stage, I remembered how my father, a gifted orator and a preacher, once saw me speak where I read my remarks. Afterwards, he told me that I was a public speaker and not a public leader. So when I approached the podium with my printed remarks, I recalled what my father said. I got nervous. I tried to remember the first line of my speech, but I couldn't. As I was struggling, something told me to speak from the heart, and that my job wasn't to say what I wanted to say but what the audience needed to hear. I knew in that moment- once I started speaking - I couldn't go back to the script. It was a metaphor not for the speech, but for my life. Once I decided to speak from my heart and exercise my gift and potential in the world, I couldn't go back to someone else's purpose. I was going to have to live my purpose, and I was going to have to speak extemporaneously for the speech. That's what I felt and experienced on that stage. I got a standing ovation and began to understand what evangelism really meant. This is an important part of my journey and life. 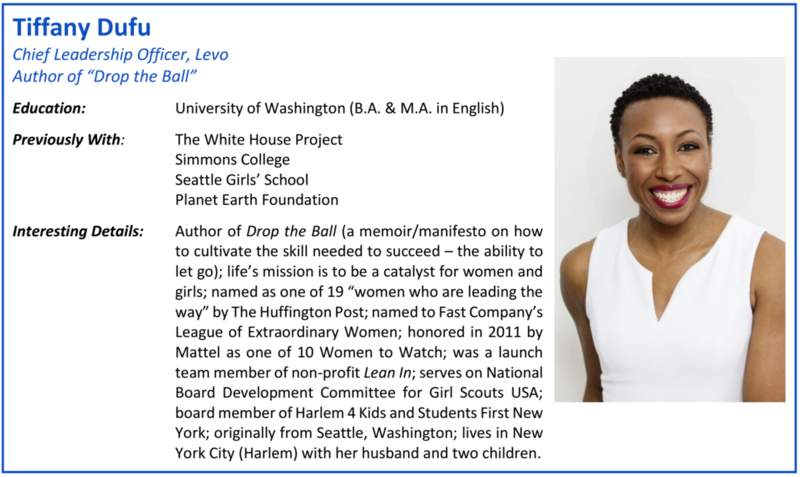 It solidified what I was here to do, which I write about in my new book Drop the Ball. Closing The White House Project was my biggest public failure. I was so disappointed since so many people supported me in my career. I remember calling someone who was involved with the organization to tell her and apologize for having to shut the organization down. She could hear the sadness in my voice, and then said it's going to be the best thing that's ever happened to me. She said I needed some grit, texture, and "street cred." She said this was my opportunity to really see what I was made of and who my real friends were. I wasn't prepared for the professional failure of shuttering the organization after I took it over. But I learned a critical leadership lesson - that it wasn't enough to just inspire and motivate people. I needed to map out how they needed to get to the finish line, lead them there, and be specific along the way. My favorite definition of leadership is from Marshall Ganz. He says that leadership is taking responsibility to create conditions that enable others to achieve a shared purpose in the face of uncertainty. Enabling others means laying out a strategy, mapping it out for them, engaging them in a meaningful way, and making their role clear to them. I didn't do this well, but I made sure I didn't repeat this when I went to Levo where I'm the Chief Leadership Officer. I rely on my own authenticity. When you don't have the resources, budget, or team to achieve a particular result, people need to know what they can trust and rely on with you. My team can always trust me and knows that whatever decision I make, my highest allegiance is always to advance women and girls. This informs my decisions and actions. And I always try to just be myself. During my career, I've gotten so many messages about who I should be. What I try to do is be myself. I work hard at being consistent with people. I've also gone from being a full contributor in my career where I focus on what I personally need to get done, to now where I think about what needs to be accomplished. Then, I find the right people who have done parts of it very well and ask them to support my success. As you advance, you learn that you can't do it alone. It's like with my new book - it was all curated by a group of amazing women. From my book editor, the woman filming videos for my blog, and my newsletter to the media around my book. This is what leadership is - finding the right talent, getting the right people on your team, and supporting them. Having the right people has been my biggest asset. This book is a testament to the biggest negotiation that I've had to make both personally and professionally. I had to renegotiate the terms of my marriage. There's no way that I could raise money, run an organization, write a book, and achieve what I've achieved if I didn't have an all-in partner at home. Before, to make everything happen I was the queen of domesticity. But I couldn't continue to take on so much. I needed help and to communicate this. It's what I call "delegating with joy." I put needing help in a higher, more meaningful context. I remember I was feeling really overwhelmed and I asked my husband to take over what seemed like two small things but meant a lot to me - picking up the laundry and reviewing floor tile estimates for our contractor. If I wanted to continue to be a leader for women and girls, nurture a relationship with him, and raise conscious global citizens in our kids, I needed to take two small things off of my list. It was a pivotal moment for me and our marriage. I could always ask for others, but I was terrible at asking for myself. Getting more help was liberating. I've learned that my best negotiations are when I'm able to frame what I need in a context that's bigger than the task at hand - when I'm able to inspire people to help me change the world and be my best self. It's a combination of two things. First, my ability to inspire people to take action through my words, which goes deeper than being a great salesperson. And second, my ability to connect people across boundaries. When I think about my book, the forward was written by Gloria Steinem, and it's been supported by people like Facebook's Sheryl Sandberg, journalist Soledad O'Brien, Reshma Saujani of Girls Who Code, and Susan Cain who wrote Quiet. It's also supported by Mara Brock Akil who created the TV shows Girlfriends, The Game, and Being Mary Jane. There are so many great people impacting the world that it's challenging to know all of them, but I'm appreciative that my work and career have transcended many boundaries. I was recently at an event talking about my book where women there were less familiar with some of the trailblazers who've supported my book. Mara Brock Akil resonated with them the most. It's such a testament that I can touch different kinds of people that follow the work and careers of a diverse range of leaders - from those working in companies and politics to the arts and media. I appeal to and connect with groups in various life phases and careers - across races and genders - and can move comfortably in and connect people across many different groups. This sounds small but it means a lot. Every school that I've graduated from - from elementary school through graduate school - somewhere on the campus there's a plaque with my name on it to mark where I have offered my service. It's important to me because I want to contribute and make a difference. It's not important to just get a degree, but I care about giving back. I'm still trying to give back today.